Everything we do at the EFCA is made possible through the prayers and gifts of people like you. Together, the EFCA exists to glorify God by multiplying transformational churches among all people. Thank you for your financial partnership. To direct your gift, enter a specific ministry, missionary or project. Learn more about other ways to give, including gifts of stock or by check. 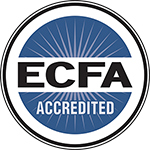 As an ECFA member, the Evangelical Free Church of America holds to high standards of accountability with respect to governance, financial management and stewardship/­fundraising practices.